One Hasselbacher, and the Grandfather of another. We have known for some time, that the mother of Peter Hasselbacher/Hazelbaker was born in Burghaslach and named Helena Barbara Lang. Her father was a miller, named Georg. We know only a little more about the Lang family. By a fortuitous and circuitous chain of events, my attention was focused on Burghaslach where two separate lines of our family crossed paths in the early 1700s. I found some wonderful things there during my visit last September. Allow me to summarize the story as it unfolded so you can share some of the pleasure of discovery with me. Wolfgang Martin was a fellow descendent of Paulus Hasselbacher of Oberrossbach. In 1979 he wrote an important summary of his branch of the family: "Auf den Spuren der Exulantenfamilie Hasselbacher." When I finally gained the skills to tackle this and other documents properly, I learned that Johann Paul Hasselbacher, the oldest son of Paulus, left Stübach to begin his family and work as a Miller in for Burghaslach. Burghaslach is only 14 km north of Münchsteinach, right in the Hasselbacher heartland. It occurred to me that Johann Paul must have known Peter's grandfather Georg Lang. Johann Paul was the first Hasselbacher of whom I am aware who was a miller. I am unaware that he learned his trade in Stübach, although there was, and still is, a mill there on the Ehe River. Ordinarily the oldest son stays in town and takes over the family home and trade. There were several reasons why Johann Paul might have wanted to leave the town of his birth, but going to work as an apprentice for an established miller could have been one. His first marriage in 1731 was to Maria Margaretha Wagner of Altheim (by Neustadt) where the marriage was recorded. Her father was a Weißbecken (as best I can tell a baker) and Siebner (one of seven border-stone watchers). In 1735, Helena Barbara Lang, Peter's future mother, would have been 9 years old. Who knows how subsequent introductions might have been made to the miller's daughter. She would certainly have known members of the Hasselbacher family. In 1753 at the age of 27 she marries the widower Johann Georg Hasselbacher in Münchsteinach. Nonetheless, I had a fine day in the village. There is a small Burg or castle on the river Haslach, and a nice village center. I had a fine cup of coffee and pastry at a sunny table while a charming local wrestled me in conversation with my broken German. I walked up and down the local stream looking for old mill sites. I found one still standing. It was a sawmill and apparently always had been. This was a possibility, but I did not find any strong leads. (I will post some photographs of the town later.) I had essentially given up for the day and started back to Oberrossbach but took a wrong turn as I was leaving the village. When I looked at the map I picked up earlier in town, I saw the location of an old historic mill. Something stimulated me to stay a bit longer and thanks to my GPS, I found myself knocking on the door of a house under the lintel "Neumühle." A wonderful older woman opened the door, and a new adventure began. I rattled out the reasons for my search and was invited inside. My poor German served as our only means of communication. My new friend brought out a box of ancient documents. The name Georg Lang immediately leaped off the pages. I still do not know the function of all of them, nor how they came to be in the house. However, I have partial translations of two of them, and they are consistant with what I have learned about the family Lang. You can view two of them here. It was my luck that the current occupants (who are not Lang descendants) also had an interest in history. They provided me with a history of the mill that had been prepared some time before. Additionally, the history of the house and mill had recently been studied by a university student from Bamberg. [I have a copy or her thesis.] When I get permission, I will present some photos of the house and existing mill-works. It is my understanding that the first version of the mill was a windmill, which would have been unusual. It was apparently destroyed by fire. I will put more of these documents online and perhaps you can help me interpret them. [Cousin Dieter rose to the occasion!] I regret that I only have a partial understanding of what I found. It was the end of the day and time was limited. I have begun a correspondence with my new friends and will try to organize my questions better. I expect to visit again. In the meantime, here is a brief history of the mill. I did not yet find the name Hasselbacher in the documents. It is possible that Johann Paul was at another mill but given that Georg and Helena Barbara had only daughters, Georg could have used some masculine help in the mill! I have learned from other such villages, that the old civil and guild records are often preserved and I may yet be able to find records of apprenticeships or lists of millers. 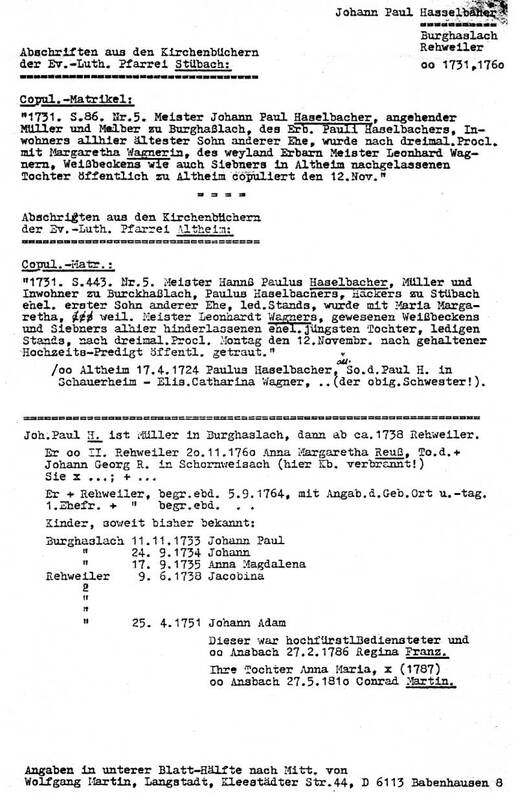 (In this way I found apprenticeship records for Johann Paul's Great-Grandson born in Ansbach and his GG-Grandson who became Zinngiessers or tinsmiths in Leutershausen.) The godfather for Johann Paul's second son Johann (born in Burghaslach), was Johann Dütsch, a miller from Hombeer. This small village is midway between Burghaslach and Münchsteinach and only 8 km from the latter! Connections had to exist! Who knows what we will find. Johann Paul's father was Paulus, my 8G-Grandfather and the first Hasselbacher of my line to be born in Germany (in Oberrossbach). Not unexpectedly given the religious turmoil of the time, Paulus became a historical figure for his religious beliefs. He was called a Separatist. This religious movement evolved into different sects that to my understanding included the Plain-Folk, Mennonite, or Amish. For these sins, he was excommunicated and expelled from the village of Stübach where he had settled. When I visited Rehwieler, I found the most extraordinary church I have yet seen in Franconia. I have no doubt Johann Paul shared his father's beliefs, but that is a story for another page!